New Orleans jazz, by the Louis Armstrong Society Jazz Band. Brief history of the band committed to continuing the legacy of Louis Armstrong and great New Orleans jazz music. The Louis Armstrong Society was formed in 2001 during the celebration of Louis Armstrong’s centennial birthday. The mission was simple: to share the legacy of great New Orleans jazz and the one-of-a-kind spirit of Louis with people around the world. That spirit was based on Louis’s perspective of life; although he played for kings and queens, heads of states, and crowds all over the world, he maintained a simple, joyous view of the world. The first public performance by The Louis Armstrong Society Jazz Band (LASJB) was on September 10, 2001 for an enthusiastic group in Fort Worth, Texas. Unfortunately, the events of the next day (9/11) would reshape world history. Unable to fly home on the morning of September 11th, the band members rented a van and drove from Dallas to New Orleans. Little did they know or understand how the events of that day would change the world and slow the plans of the Louis Armstrong Society. Performances continued in 2002 and 2003 across the country although the scheduling of dates was tenuous. Airline security and arts funding changed as we all tried to come to terms with a new reality. In the spring of 2004, a decision was made to proceed with the opening of a jazz club called “Satchmo’s Place” in the New Orleans’ French Quarter. The time seemed right. The world was adjusting to a “new normal” and it was time to start again, to carve out another special corner in the French Quarter dedicated solely to New Orleans jazz. “Satchmo’s Place” opened in September of 2004 with the band performing two shows a night, five nights a week. In August of 2005, the society reviewed the operation and declared it a success. People were lined up to purchase tickets and the grass roots support was beginning to swell. We announced, “Come see us right after Labor Day!” Hurricane Katrina hit August 29, 2005 and once again the society faced a world- changing event. Although the society’s jazz band continues to perform for private events from time to time, “Satchmo’s Place” was economically devastated and was unable to reopen in the original location. The musicians have been scattered from as far as Europe to Japan and some remain there to this day. 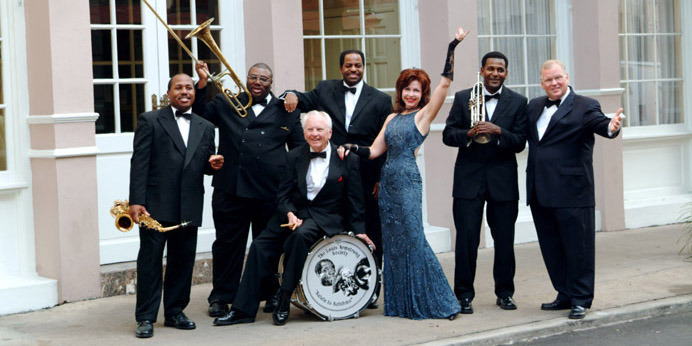 In spring of 2009, the Louis Armstrong Society Jazz Band began to present weekly performances at a local restaurant in the New Orleans French Quarter. The band continues to play New Orleans jazz at private events and public performances all over the country, from Utah to Georgia, and is available for bookings at festivals and private parties.